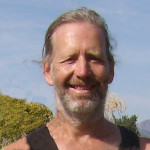 farmermike , that plant in lower right of your picture is the first I'v seen with green lobed leaves. Will be interesting to see what comes from it. Here is a photo of that plant today. 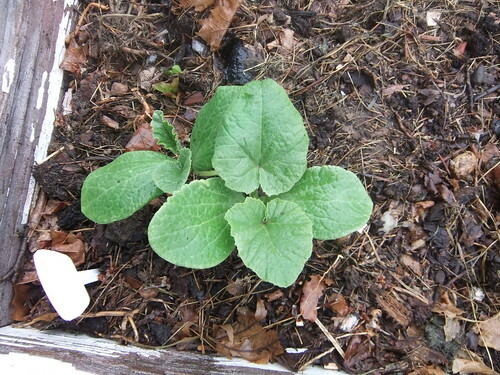 None of the other plants in the patch have such deeply lobed leaves like this (even those with purple leaves). The only other that comes close is the one orange root variety, from the grocery store, that I managed to salvage from last year. Most of the seed grown plants and the Sandhill plants have heart shaped leaves. Edit: Also, you can’t see them in the photo, but that plant is also the first to form flower buds! SF Bay Area, Contra Costa County -- Inner Coast Ranges, former Oak Savanna. Hot, dry summers; cool, wet winters. ~240 frost free days. Last/first frost: Mar.15/Nov.15. Avg. annual precip: 17"(432mm). 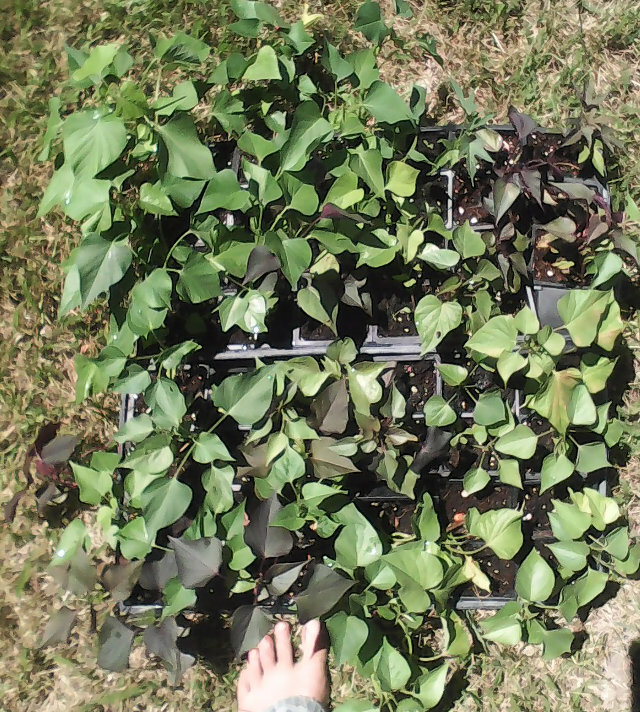 Here's what my sweet potatoes looked like yesterday before planting them out... Some of the plants already have flower buds on them. They will be flowering for the longest day of the year, like they were last year. 2018 seedlings: Seems to be a lot of variation in vigor. They look great! Joseph Lofthouse And darn it you got a lobed green leaf too. Not that it matters that I know of, just that I'v never had one. I don't think they care the least bit about day length, my experience is they start blooming and keep blooming till frost puts an end too it. You plant your's in the ground don't you? I did that with a lot of later sprouting extras this year but man, it's a chore inspecting for seeds when they are on the ground. Also put some of my favorites from last year in the ground for food production. I'll do my best to collect the seeds but probably have a lot of volunteers next year. My mother grows sweet potatoes, in a raised bed, in sandy soil. They love it under those conditions. Mine get planted into silty soil in a field. Most of the seeds I collected last year matured on vines that were yanked up and put in a bucket of water in the greenhouse. Are you thinking that the green-lobed are hybrids? Because the lobed trait originally came from the decorative plant? I know this project will take awhile but this project excites me. Can't wait to see how this progresses. I'd love to reliably grow TSPS. Maybe someday. Yes they do great raised but I do them that way for two other reasons. One to protect from rabbits and two so I don't have to stoop over looking for seeds. Here once they start maturing seed which I think was late July last year, don't remember for sure, they just keep it up. They are indeterminate in the extreme with mature seeds and fresh buds on the same plant all the time. Plus even if you noticed a capsule was maturing by time it finishes it's hiding under new flowers or leaves. 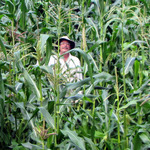 I have to go out every single day, sometimes more than once a day and collect that day's crop. This went on into October last year and November the year before. If you have a bunch then miss one day and you lose some seeds. I didn't grow the original ornamental last year so the green lobed are maybe F2 or F3 but not F1 hybrids. I don't remember exactly but I think probably 50% of the seeds I sent came from "Bushy Bloomer". It I believe, may have been an F1 with the ornamental but it bloomed and seeded way more than even they did. It had heart shaped leaves but they were not green. I think all that have heart but not green leaves also fit that same fuzzy definition. Heck, I don't know what to call em. The seeds from 2016, which were a mix of F1 and F2 from 2015 grew and made the seeds in 2017. I did have another variety, Beauregard, in 2016 that bloomed so maybe a little of its pollen sneaked in but rabbits ate it's seeds. Other than that it is just mixing and remixing from the original 2014 and 2015 seeds. Last year I saved first and best seeds in their own packs and am doing that again this year and even culled quite a few that I didn't like the look of. I guess what I'm trying to do is concentrate the traits I want. I worried a little about creating inbreeding but don't think that will be a problem for a long time. The amount of variation in all observable aspects is extreme with things showing up that don't resemble any of the original parent lines. I think rather than cold tolerance the key might be in fast maturity, edible, storable roots in 60 to 75 days. I'm on it. Nice. I wasn't necessarily referring to cold tolerance, though that would be awesome as you could leave them in the ground like regular potatoes. Hmm.. more starchy "sweet" potatoes might be better for that aspect.. I think i was more referring to reliable flowering and seed set in temperate climates. But yes, fast large maturity would be good. 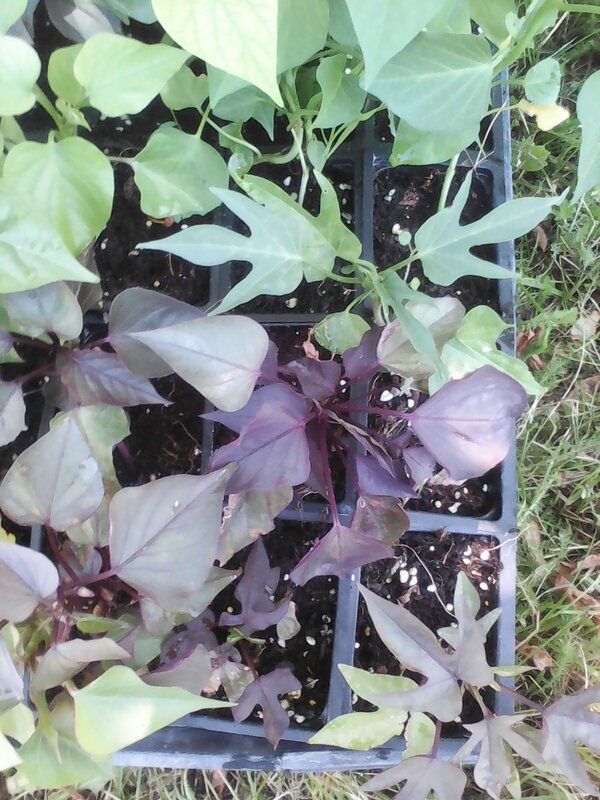 Could One start a sweet potato selection without seeds by just keeping only the largest roots and to keep growing slips from them the next year? Would they keep getting bigger over time? Or Would the genetics limit the size? I guess the question I'm asking that probably does not have an easy answer is, how much does epigenetics play a role here? Can we nudge the epigenetics enough in the direction we want until they could flower and grow more reliably in our climates? keen101 (Biolumo / Andrew B.) I guess I just assumed with you being in N Colorado that you have a shorter season than I do and cold tolerance would be beneficial. I think with the radiant cooled nights Joseph's will will help discover if there is indeed variation in cold tolerance. Most of them so far have been on the more starchy side and I think they are good used in several ways where potatoes are normally used. Some have an odd, off putting texture but most are fine. I'v only have one seed grown so far that meets my cultural definition of sweet potato, in that it is very sweet. It was also a good seed producer and a fine keeper and slip producer. I have lots of it's clones and it's children growing this year. Don't know much about epigenetics but it is true that they mutate. One slip from a stored root came out this year with different color to the leaves. I suppose if they can mutate for leaf color then other traits are subject to that as well. I'll have to wait till end of season to see if it's roots are different. I also have no explanation for a couple new phenyotypes that are different from any of the parent or grandparent plants. 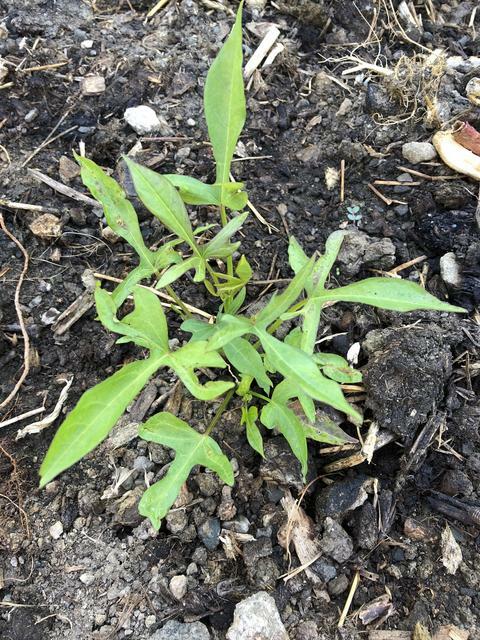 Research indicates that is common in the first few seasons of a new seed grown plant but just one has showed up. Another difference in our climates I guess is worrying about getting larger roots. The variety Beauregard for example can make roots greater than 5 lb here. I like the notion of one that makes lots of smaller roots and had a couple that did that last year but they didn't make seeds or even bloom much and the roots were not sweet so back to the drawing board on that. Ah, I came up with an explanation, excuse for why others got seedlings with lobed green leaves and I didn't. It's cause of their fancy, well controlled germination methods. Those seeds just don't sprout on a cold drafty windowsill in dirt mostly just scraped up from the garden. HA HA, their wimpy. But I'm still jealous. Interesting, I have plenty of lobed purple ones but there are none in the first to sprout group, nor if I remember right were there last year. On the other side of that 2 of 3 cold frame and 3 of 4 volunteers from this and last year combined are lobed. Still purple though. Another 10 years at it and we may know for sure about habits and traits of seed grown sweet potatoes. Found three more volunteers yesterday, outside the garden fence. Couldn't figure it out but remembered that is where I set those plants last year after I had dumped them out removed the roots and replanted. Those were some of my best and favorite plants. These volunteers look great and have only sprouted within last couple days, no true leaves yet. There has also been no rain at all for some time, very interesting. 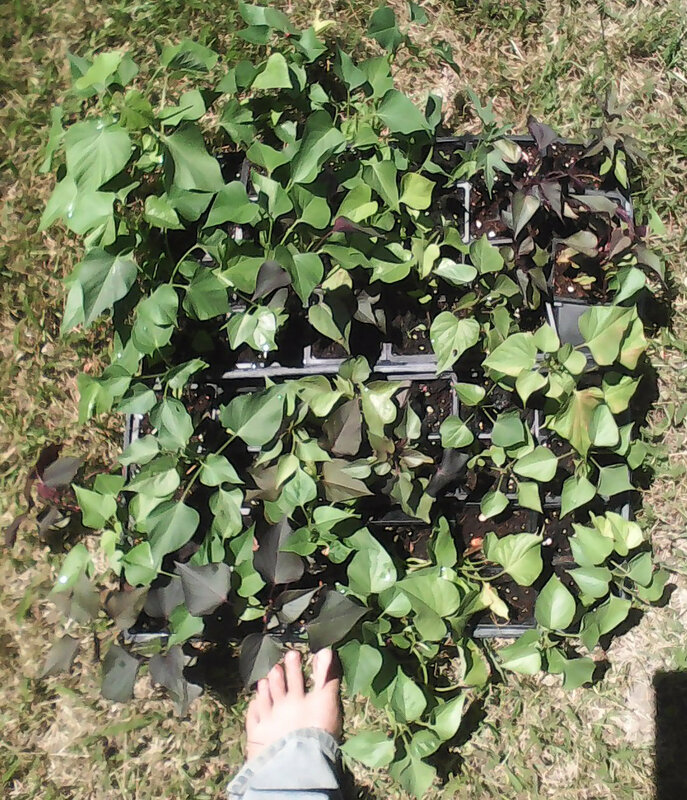 I'm gonna move these plants inside the fence, safe from rabbits, and see if sweet potatoes sprouted from seed in mid June have time to produce. Blooming is really starting to pick up now and the little bumblebees are starting to notice. I could have but didn't hand pollinate the previous flowers but still I noticed a couple capsules forming. Bees must have sneaked in without me noticing, as I think even a self pollinating flower can't do it without something to move the pollen around. 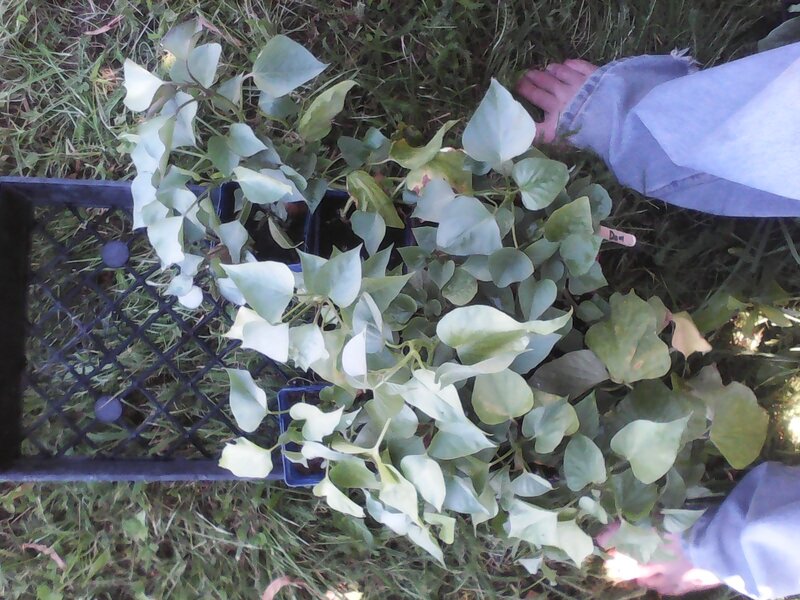 New daily sweet potato chore besides checking for seeds, squashing Japanese beetles. Never much of an issue before, they are particularity fond of the darker green and purple leaves.